While baby has arrived, I've got a few more pregnancy outfits scheduled to share on the blog. Being behind with blogging has worked out well, I still have posts to share while I'm spending the majority of the newborn days in my PJs! First up, although it's April I won't be doing a budget post wrap up. I didn't buy any new clothes or accessories in March, instead shopping for a few things for baby. Since I didn't buy anything, I won't be sharing my purchases and just doing a my regular post with what I've been wearing. I tried to schedule as much as possible at the beginning of my maternity leave, so I had a busy couple of days of appointments and running errands. 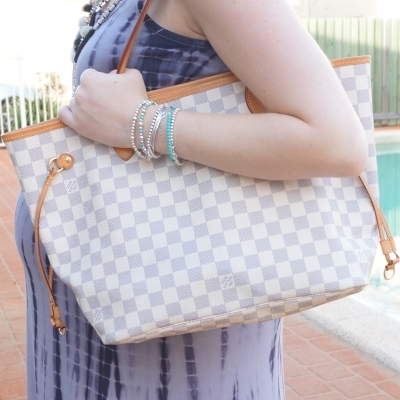 My Louis Vuitton Neverfull was a great bag to just throw everything in, and maxi dresses were easy fuss-free outfits. I may have been a little over enthusiastic with fitting everything in on this day! I had scheduled 4 appointments and spent the morning rushing around between them. Wanted something easy and simple to wear so a maxi dress was my first choice - instant outfit, no further thought needed. At 38 weeks pregnant I can't help but wonder if the next time I'll be wearing this dress I'll be picking it as it allows for easy breastfeeding. Last worn: glitter belt, MEV maternity maxi dress, gold Havaianas, Louis Vuitton Neverfull. Other ways to wear: glitter belt with a blue dress, maternity maxi dress and sequins for Christmas, Louis Vuitton Neverfull and a graphic tee. Unlike the outfit above, this dress wasn't my first choice for this day. I'd planned to wear my maternity denim shorts but rain got to the washing outside before I could and my shorts were too wet to wear that morning. Again I picked a maxi dress for simplicity. It was nice to be a little dressed up for dinner with my parents at least, and this dress is great to wear, even if not what I had planned. I've used the Louis Vuitton Neverfull as a baby bag before, but this time I tried it out with just the bare essentials and it was much more comfortable. I'm trying to go out now and then with just a little pouch inside my handbag with everything toddler T needs, instead of carrying the baby bag as well as my handbag. While a newborn will mean I'll definitely need to carry the baby bag around with me, limiting what I carry will be helpful with needing to take things for a newborn and a toddler. I'm terrible at over-packing and carrying more than I need! Last worn: tie dye maxi dress, black Havaianas, Louis Vuitton Neverfull (above). Other ways to wear: tie dye maxi dress for a night out, Louis Vuitton Neverfull and skinny jeans. Linking up with Flashback Fashion, Passion for Fashion, Fab Favourites, The Ultimate Rabbit Hole, Modest Monday. Looking at these pictures makes me mss the bump already a little. But only a little bit. It is a great bag! Was on my wishlist for a while too! Kudos to you for keeping stylish when it would have been so easy NOT to! You look amazing! 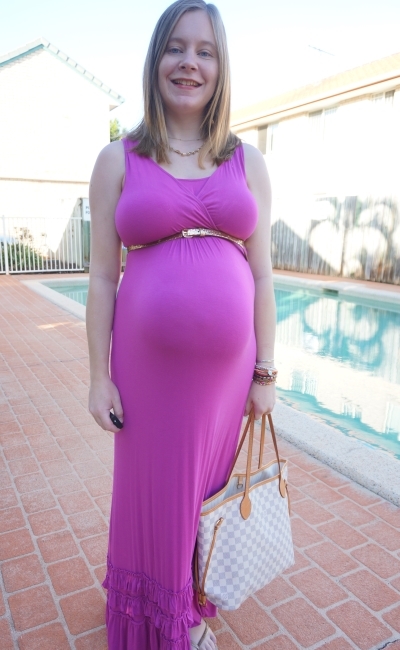 Thanks, I think a maxi dress is an effortless way to look stylish, even while pregnant! Glad the outfit "backlog" worked your way - also it was a great idea to not shop in March. I was quite good in March too! Only 52 bucks spent. I love both of these dresses, especially the pink--it's such a gorgeous color! I'm guilty of over-packing too. I'll be curious to hear how you make it work with toddler AND baby stuff (and your stuff of course) in your bag! Originally I thought I wanted to ad a ton of maxi's to my wardrobe for the late Spring and Summer months. However, I've been trying lots on and haven't purchased a single one! Now I'm on a no buy, so hopefully this month long break will get me back in the groove for May and I'll find something super cute. I'm weird with fabrics though and so many cling to me. What's a good fabric to look for in a maxi? Congratulations Mica! I'm so excited for you now that the baby's here :) And that magenta dress is honestly stunning on you! Love this review! I've been lusting over this bag for YEARS but have yet to take the plunge. Congratulations on the new arrival! You sure know how to rock a maxi dress - that fuscia colour looks ace on you! I bet you look super stylish in your PJs too! The maxi dress looks very beautiful..
Oh my gosh, congrats on your baby, so precious! And you look beautiful in both of these outfits, I love your bag! <3333 you look so lovely! Ohhh i love that LV bag. You look gorgeous in 38weeks. Hoping for a asafe delivery anytime. You look like a seriously godess in those maxi dresses Mica! I especially love the hot pink number, you are one sizzling mama! I'm impressed you didn't buy anything in March. This LV bag is so classic. Sounds like your maxi dress was a great choice for a day with so many appointments. Hope you all are doing well! haha yes I've overstuffed the bag and it is not comfortable at all :( But it's good for carrying the usual plus a little extra. I love love love my NeverFull! You maintained such excellent style during your pregnancy, I am bowing down to you!! That bag is so gorgeous and classic! Love it paired with the maxis! I used to carry big bags like that but now I have realized that it encourages me to carry more than I should! Yes, it's easy to overfill when it holds so much! That shade of the dress is super flattering! Love all your arm candy too! Thank you all for your kind comments and congratulations on baby's arrival.